If you are a fan of Gap jeans for yourself or anyone else in your family is and could uses a new pair...check out this promotion Gap currently has going on! From today March 5th through March 14th, 2010 bring your old denim (Can be any brand, and can be jeans, a skirt, a jacket, etc) and recycle them!! Along with helping the environment, you'll also receive a coupon for 30% off any regular priced denim in the store! 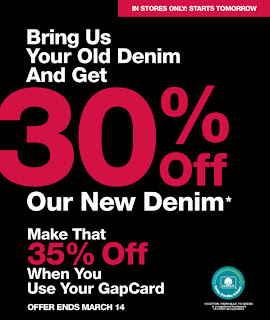 Or save 35% when you use your Gap card at checkout. Curious as to what your old jeans will be made into? Eco-friendly housing insulation. This deal will be honored at Gap, Gap Kids, and Baby Gap. Valid in-store only.